The Payments screen allows you to process and monitor all payments made through Gateway. 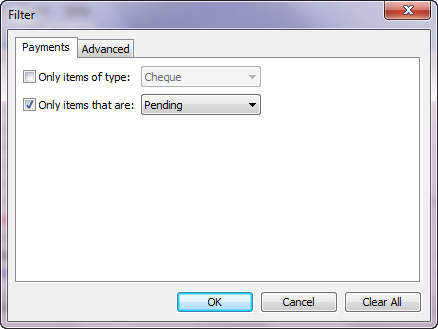 A filter allows you to refine the list of payments displayed by nominating specific details eg. display only cheque payments. The view will then only display those payments matching the nominated criteria. Grey indicates the payment has been processed. Red indicates a pending payment where there are insufficient funds to process the payment. Black indicates a pending payment where there are sufficient funds to process the payment. A message will display if processing the payment will reduce the funds available for withholding money, commission and sundry charges. Blue indicates a pending payment has been entered with a release date. Gateway will remind you if you attempt to process the payment prior to the release date. To drill down into any of the payments to view the details double click the item. Go to the main menu, click Transactions then select Payments. The Payments dialog box displays. Click View then select Filter – the Filter dialog box displays. Payments – tick the relevant payment type eg cheque or journal, and the payment status eg. processed or pending. 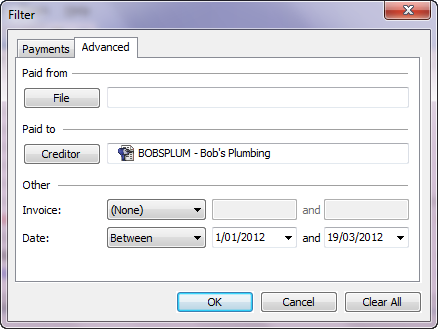 Advanced – advanced options for filtering the files such as date ranges, nominated creditors. Select the filter options you require and click OK to return to the Payments dialog box. The dialog status bar displays the message, Filter Applied. Note: If you are unable to see all the payments you would expect on the screen, check the dialog status bar. If the message Filter Applied appears the filter needs to be removed.